Meet One of Our Members! Every quilter is influenced by the work of others. Just ask Yvette Thorn! When asked what prompted her interest in quilting, she just can’t get the name out fast enough — Caryl Bryer Fallert! She remembers exactly when she viewed some of Fallert’s stunning work: at a quilt exhibition at Naper Settlement in April 2003. That was the start of Yvette’s fascination with pattern, design, texture, color, and all those other qualities fabric artists wrap themselves around. Soon after that beginning, while taking a class at a local quilt shop, she was invited to attend a RQG meeting. She became a member and has since held positions in publicity and programs as well as newsletter editor. Starting out at first to quilt on her dining room table, she soon had a better idea and converted her living room into a well-organized quilt studio. Her brother, a master craftsman, built a generous folding table that works hard as her cutting, sewing and design area. Surrounding and under it are bins of fabric and other assorted quilting necessities. She also has a significant supply of beads and jewelry making materials, an interest she shares with her sister.Several of her small quilts hang in her studio, including A Walk along the Creek, for which she was awarded a blue ribbon by her guild member friends. Normally Yvette has three or four quilts in process at a time and, yes, she does make bed quilts, too, in addition to her eye-popping art quilts. On her table was an orange and white single Irish chain whose main purpose was to use up some orange fabric. 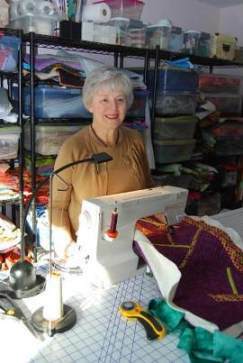 Although she does much hand work to embellish her quilts, she does her own quilting with her home sewing machine. 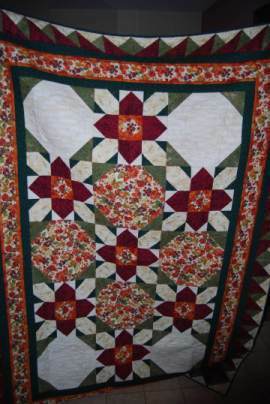 Although a simple grid pattern will do on the orange and white Irish chain, she acknowledges her great enthusiasm for very graphic quilts that she can fill up with specialized quilting. That is when she escapes into a zen-like tactile place that works best with no television or other interruption. However, while machine piecing she enjoys listening to some of her Great Courses lectures. What part of the quilt process most grabs her attention? “I most enjoy the engineering of a picture, getting the right perspective, figuring out the layering effect. Those are the details that intrigue me.” Having no art background, she took an art class about color at College of DuPage. She credits that class for her skill in bringing out the best in her fabric colors. Her inspiration for designs comes from all over, including photos, magazine ads, even a cup and the Chicago Cubs, or anything else that allows her space for her machine quilting. One of her new delights is the thread work she learned from Ellen Ann Eddy at a recent guild meeting. She is itching to devote more time to some ideas she has for this technique. 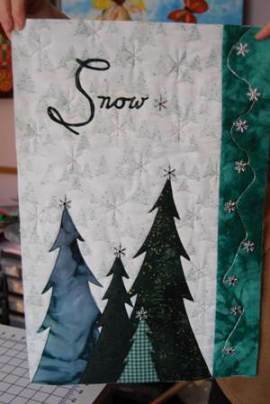 One thing Yvette emphasized several time is how impressed she is with all there is to learn from other quilters. She is grateful for the guild friends she’s made, as well as the quilt teachers who share their knowledge and ideas so readily.